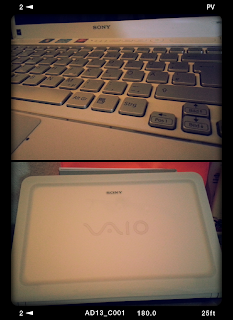 Perhaps its my fault... but after a little over two years of using my laptop, she suddenly died on me! :( Maybe its because I don't put it on sleep mode whenever I am using it and just let it run 24/7. To think that I have so many files in it, including my thesis data and report, and images from our travels to name a few. When I asked my personal hardware technician a.k.a. husband to take a look at it for me, he said that it's most probably because of the fan. It doesn't work anymore so that the system automatically shuts down the computer when the processor gets too hot to prevent it from doing further damage. So all I had to do was look for a replacement fan on the internet. It's also one of the reasons why my husband was skeptic about Sony Vaio laptop computers because it usually is good only a little bit after the two-year warranty period. So I guess the next time I buy a Sony Vaio laptop computer, I should get a three-year warranty so that when it dies on me a few months after the two years general warranty, I can still claim for free repairs and services. I hope the fan I ordered online comes soon... So I can make a back-up of my files and work on the article I promised a friend to write for a university publication.